Free Artwork, Email Proofs, CMYK Full-colour Printing, Gloss Laminated and GST included. No other manufacturers or resellers can offer you the same quality at the same low prices. Fully gloss laminated, the lamination film gives your sign extra protection from rain water, mud, and scratches. So you can clean your car magnets easily and quickly. No limitations on colours, you can add your business logo or favorite photo onto the sign. High resolution full-colour printing, which means even 8 point writing will still be sharp on the edges. 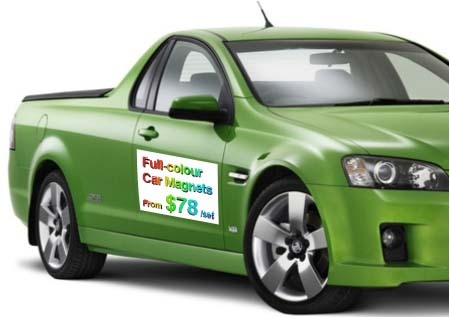 Our magnets material are specially UV coated on the back, which can prevent scratch of car painting. It is very flexible and high strength magnet, and definitely will not come off at high speed driving. If you find any better price, please do let us know. We will not only match that price, but also give you extra 10% discount.